Disclaimer: This is a satirical news piece, just for fun, read at your own risk! The US President's annual State of the Illusion address on Tuesday held up a mirror for millions of television viewers of the Wonderland he is dreaming of with rabbits in top hats and turtles drinking tee. 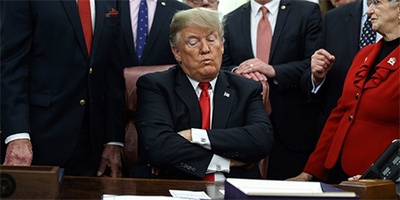 He also deliberately stoked fresh tensions with the Democrats over his Mar a lago golf club wall, using rhetoric that may make it more difficult to forge any kind of compromise to defuse a standoff about the 9th hole the president never managed to reach due to illegal immigration.